A blog about politics - especially antifeminism and men's rights - and gaming. 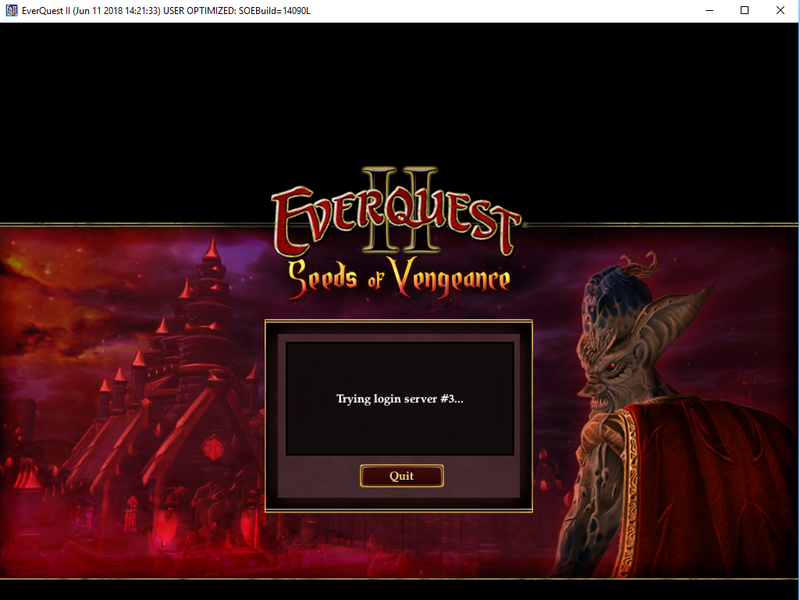 connection issue - "Could not connect to a login server. The Servers may be busy". 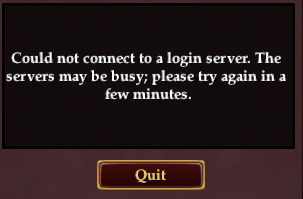 I couldn't connect - i'm pretty sure it was the time of the last patch. Checked server status, was told they had been up for a few minutes, gave it a few, tried again, nada, left for an hour, nothing, another hour, same, talked to others who told me they were fine. I have deleted cache as per instructions and have no other internet problems. I even re-downloaded the launchpad and installed it. I have run verify files. Yes, the modem and the computer have been powercycled. The windows 10 firewall allows the executables. 1. Who is your ISP? 2. Make and model of the modem and router? 3. Are you at home/school/office? 4. Type of connection (Wireless/Wired)? 5. DSL, Cable or Fiber? None of the above, it is an NBN connection. Basically a hybrid between fiber and copper. Please try accessing the game again to see if your issue has been resolved. Maybe the patch server is just being hammered or something. It looks like I can download fine from the https://www.nexusmods.com site so i suspect the problem is at your end somewhere. Ok, i just hit retry and retry and i finally got the patch downloaded. Looks like everyone else was hitting that at the same time. But it didn't help - same error as original. Please follow the instructions in the provided link to produce the DXDiag and MSInfo files and submit the files as attachments to the ticket to further troubleshoot your issue. Done. I had a look at a tracert but it looks like it's effectively worthless nowadays. Added pathping and checked by pinging google a hundred times - no packet loss. Thank you for contacting us regarding your issue. I understand that you are experiencing an connection issue involving the game server login when trying to run and play the game. I am seeing in the system information files that Windows 10 Build 1804 is currently installed. Something you may wish to try is rolling back the current Windows 10 build to a previous build of Windows 10, perhaps Windows 10 Build 1803 or earlier if possible, to see if the issue continues. For assistance with this step, you may wish to try contact Microsoft Support. Ok, I understand you want to close the ticket, but I see no evidence that this is a problem with windows. The more logical assumption is a server side issue, since you have just had huge problems currently with server side issues causing difficulties with connection. If your launchpad isn't compatible with windows 10 - it's time to fix the launchpad. Updates are automatic and mandatory with the operating system your client runs on. Otherwise, is there an option to escalate the problem for investigation? I see that you are using a wireless connection. You may wish to try using a wired connection rather than a wireless connection. It sounds like you are fobbing me off. Is escalating this problem an option, or are you just closing the ticket because the problem is difficult? Thank you for waiting on me to get back to you. I appreciate it. I checked out the issue and it sounds like you are experiencing a connectivity issue. However, as much as we would like to try to help, we will not be able to provide support if you believe the issue is not resulting from the local machine or connection. Our intention is to help you resolve the issue but Player Support can only provide suggestions to address issues that arise from the user end. If you believe the issue you are experiencing is a bug with the game client or an issue with the game server, we must kindly advise submitting a bug report to the Daybreak Community Issue Tracker to help out our team. Thank you for your patience and cooperation. I certainly hope the issue clears up for you soon. It's not exactly a connectivity issue if I am able to log in with launchpad, select a character, and THEN not be able to zone in, using any account, using any zone. However, I can see you want to close this ticket and that investigation of that issue (which others have reported for about 5 years) is just not going to happen. I will observe the client to see if it works after the next patch, and if not, end my account. Please try to avoid logical fallacies! The Animated Version of "Lord of the Rings"
Fallout 76. Now for people who hate Fallout!